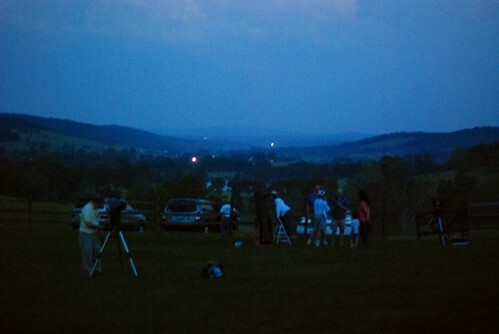 Saturday night is the monthly telescope party at Sky Meadows State Park. The skies there are darker than in the city, so you'll see a lot more if it's a clear night. It's also a great place for a walk, before it gets dark. Someone will give a short night sky orientation at dusk. The only catch is, you'll need to dress warmly at this time of year. There is a $4 parking fee per car. Cover flashlights with a red filter or a brown paper bag -- this will keep you from dilating someone's eyes and ruining their night vision. (And these guys are really serious about their night vision, trust us.) In rain or cloudy weather, there will be a short alternate program. If you prefer to stay in the city to hang out in the dark, a Rock Creek Park ranger will lead a lantern-lit hike for ages 5+ on Saturday, leaving from Peirce Mill at 5:30 PM. Bring your own flashlight. Rain or severely cloudy weather will cancel this event. Your weekly dose of enlightenment comes via the Sierra Club - they're leading a 5 mi. (very moderately paced) walk to visit part of the Inter-County Connector (ICC) to examine its impact on stream valleys and watersheds in Montgomery County. "Paint Branch is unique to the area, for supporting the last remaining native brown trout population, and this is a beautiful hike." Meet at 10 am in the parking lot of Valley Mill Park (1600 East Randolph Rd., Silver Spring). Contact leaders for Metro pick-up. Bring a bag lunch and you can continue the conversation after the hike. Leaders: Kris Unger, krisunger@gmail.com or 301/980-5621 and Mike Darzi, michael.darzi@saic.com or 301/580-9387.